With HP Envy 5644 e-All-in-One you can print directly from PC or remotely through smartphones and tablets using wireless connectivity option. Easy to use scanner and copier is also integrated into the device. This all-in-one from HP is quite heavy with a weight corresponding to 8.2 kg. Going further, the device measures 45.4 cm in width, 41 cm in depth and 16.1 cm in height. Navigation is made simpler with a 2.6 inches touchscreen. Documents can be printed at a speed of 12 ppm while colour photos can be printed at a speed of 8 ppm. Borderless photos can be printed from a separate photo tray eliminating the need to use the loaded paper tray. High-yielding HP Envy 5644 e-All-in-One ink cartridges and automatic duplex printing offer a great way to cut down on printing costs. The USB connection offers to print from cabled devices such as a PC. You can also print straight away from different types of memory cards. The inkjet is compatible with many versions of Windows and Macintosh operating systems. HP Envy 5644 e-All-in-One is a compact multifunction solution for light to medium duty use in the home and small office environments. Flexible printing options through mobile devices, Google Cloud, and memory cards makes it more appealing. Separate photo tray and scan to email are exclusive features making the operations easier. The device is a rather comprehensive solution for small workgroups and families. How to clear “paper jam” error for HP Envy 5644 e-All-in-One printer? To prevent damage to the printhead or to the HP Envy 5644 e-All-in-One ink cartridges jammed paper must be removed immediately. Turn the printer off and follow these steps to remove the jammed paper. Step 1: Open the cartridge access door. Step 2: In the printer locate the paper path. Elevate the paper path cover handle and, remove the cover. Search the location of the jammed paper in the printer. When you find the jammed paper, hold it with both the hands and pull it in an upward direction. Note: Be careful while removing paper. Do not tear the paper while removing it from the rollers. No torn pieces of paper should be present on the wheels and rollers of the printer. These remaining small pieces of paper can create a printing issue. Insert the paper path cover until it fixes into its place. Step 3: Check for the print carriage area inside the printer, if the issue is not resolved. Make sure you do not touch the cable attached to the print carriage. Move the print carriage to the far right of the printer. Note: If the carriage is unable to move, reinstall the ink cartridge. Since improper installation of HP Envy 5644 e-All-in-One ink cartridge can jam the print carriage. Pull out the jammed paper slowly in the upward direction, without keeping any piece of paper untorn. Now take the print carriage to the extreme left of the printer and repeat the same step as done above. Close the HP Envy 5644 e-All-in-One ink cartridge access door. Step 4: Inspect the tray area, if the issue is not fixed. Pull the input tray outward. Turn the printer on its side, in such a way that it exposes the bottom of the printer. In the area where the input tray was present, check for the paper jam in that area. If you are able to locate the piece of paper in that area, remove it carefully. Put the input tray back into its position. Step 5: Turn on the printer. It is recommended to take the test print to analyse the print quality. Q. 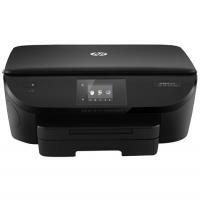 Can you tell me if you provide any original/genuine ink cartridges for the HP Envy 5644 e-All-in-One printer? A. Yes, we provide genuine HP Envy 5644 e-All-in-One Ink Cartridges on our website. Q. Does the HP Envy 5644 e-All-in-One printer support printing through a mobile phone? A. Applications like HP ePrint, Apple AirPrint and some other solutions are supported for mobile printing by this printer. It supports printing from most smartphones and tablets using these operating systems: Android, iOS, Blackberry and Windows. Q. Does the HP Envy 5644 e-All-in-One support the automatic duplex printing feature? A. Yes, this printer supports Automatic duplex printing. Q. Is the ink used in your compatible HP Envy 5644 e-All-in-One Ink Cartridges of good quality? A. Yes, we use premium quality ink in our compatible ink cartridges. The quality of our compatible ink cartridges abide by the ISO norms and standard which make them a good choice for your printer. Q. I want to order a 2 pack of your compatible HP Envy 5644 e-All-in-One Ink Cartridges from Limerick. How long would it take for it to be delivered to me? A. All our orders are delivered by Fastway Couriers. Almost 90% of our orders that are received before 12 noon daily are despatched the same day and delivered on a 1 - 3 delivery day basis. Fastway couriers deliver all our products. They will deliver between the hours of 9 am - 5 pm (Monday - Friday). However, if you require the product on an urgent basis, you can call us at 048 30833221. You should keep being aware that there are times when we are unable to keep our promise of 1-3 delivery. This could happen due to a rural location or Fastway couriers’ network distribution. Q. Will I receive a set of HP Envy 5644 e-All-in-One Ink Cartridges in the box of this printer or will I have to purchase it separately? A. Yes, you will receive a set of ink Cartridges when you buy this printer. You can find a range of HP Envy 5644 e-All-in-One Ink Cartridges on our website when your starter ink cartridges run out.